Picasso's "Le Soupe" is currently part of "The Steins Collect" exhibit. Once I started thinking about soup, I started seeing soup everywhere. Even in an art museum. On a recent trip, I decided to take in “The Steins Collect,” an exhibit at the San Francisco Museum of Modern Art. It’s an amazing landmark collection of the holdings of Gertrude Stein and her two brothers. The Steins were great patrons of the Parisian Avant-Garde and collected Picasso, Matisse and Cezanne, to name just a few. 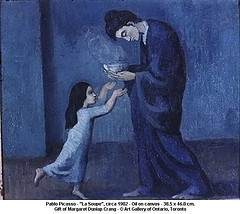 One of the paintings is called “Le Soupe,” painted by Pablo Picasso during his Blue Period. Picasso said he started painting in monochromatic shades of blue and blue green after his friend Carlos Casagemas killed himself. You can see the painting has a melancholy air to it. On a bright note, seeing “Le Soupe” led me to a wonderful blog written by a Sydney based art historian named Megan Fizell called Feasting on Art , who combines art and food and photography. Lovely! Finely chop the onion and garlic. Add to a large pot over medium high heat. Add the melted butter and saute until the onions become soft, around 5 minutes. Cube the potatoes and the stalk of the broccoli and add to the pot with the vegetable stock. Bring to a simmer and cook until the potatoes are tender, 15-20 mintues. Chop the flower portion of the head of broccoli and add to the pot. After 2-3 minutes, add the nutmeg, salt + pepper and blue cheese. Stir well and use a hand blender to puree the mixture. Once smooth, spoon into bowls, drizzle with olive oil and garnish with fresh herbs. This entry was posted in vegetable soups and tagged blue cheese, broccoli, Picasso by soupbabe. Bookmark the permalink.